Monday March 6th 1893 I was busy about the work most of the forenoon and began work on my old green dress after dinner. In the evening I started to put sleeves in my old wrapper. Tuesday March 7th 1893 I sewed a little in the forenoon and done some work in the afternoon. Hattie & Alice Haines were here and Mrs Sorter called. I fixed my light dress sleeves in the evening. Wednesday March 8th 1893 It rained all day long. I depended on Josie to do the work and I worked all day and evening on my green dress. 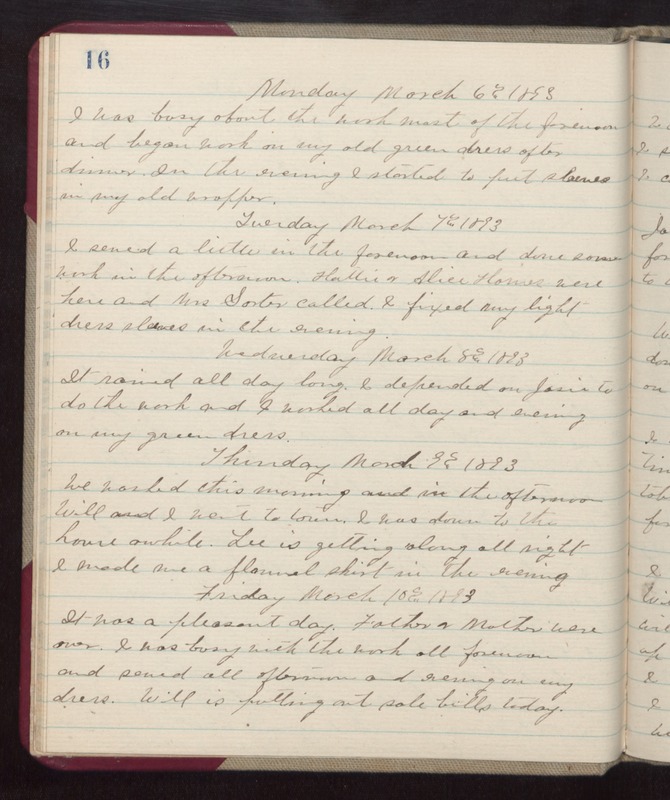 Thursday March 9th 1893 We washed this morning and in the afternoon Will and I went to town. I was down to the house awhile. Lee is getting along all right. I made me a flannel shirt in the evening. Friday March 10th 1893 It was a pleasant day. Father & Mother were over. I was busy with the work all forenoon and sewed all afternoon and evening on my dress. Will is putting out sale bills today.